To outsiders, the cars parked outside the Moshofsky Center were merely there to allow people to enjoy an event put on by the Oregon Football program. To the players, the coaches, and the fans, though, it was much more. Scouts from all 32 NFL teams came to watch hopeful first round picks, Marcus Mariota and Arik Armstead, as well as multiple other former Oregon Duck seniors and stars. Mariota had an average Pro Day. 1. Mariota’s combine performance means absolutely nothing. The Hawaiian came out under center, something pro scouts were not used to seeing, and completed 60-67 throws while calling plays from a huddle. He overthrew a few deep balls; he missed on a curl to former Ducks receiver Cameron Colvin and he was short on a flat route to Kenny Bassett. Exactly, Will. No one knows what it means, other than it likely means absolutely nothing. Mariota missed a few throws with no pads on, no defense in his face, and without the ability to showcase his other premiere attributes (his legs, for example). Teddy Bridgewater had one of the worst Pro Days of all the QBs last year, and he ended up being the best QB drafted from that class. On the contrary, Johnny Manziel had an excellent Pro Day and ended up having one of the worst rookie debuts in recent memory. In short, don’t take everything you hear about Mariota’s Pro Day that seriously. 2. 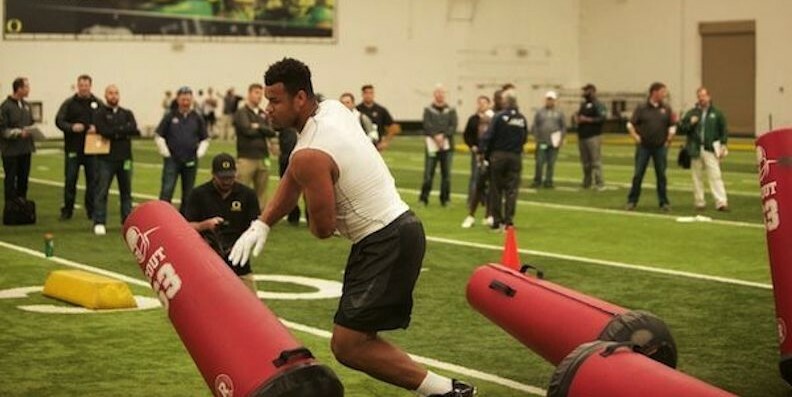 Arik Armstead is going to be hard to pass up. Forget the fact that he underperformed at Oregon. Forget the fact that he opted to not run his 40 at the Pro Day. Forget the fact that he probably could’ve used another year of fine tuning at Oregon. Armstead is freaking ENORMOUS, and for most NFL teams that might be all that it takes. The 6’7″, 292-pound freak of an athlete is so promising to NFL scouts that some experts believe he could be a top ten pick. Armstead was one of the few Oregon players who got to do their own workout for all the teams, and in that short time he showcased just how disruptive he can be. Although he’s going to need some coaching up, Armstead is certainly not lacking in power. 3. Dior Mathis boosted his draft stock by a LOT. Dior Mathis showed off his athleticism. 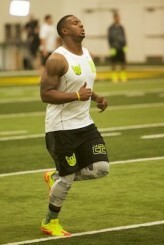 Many Duck fans know Mathis to be inconsistent. The 5’8″ cornerback is undersized, but his athletic capabilities always showed promise. How much promise, you ask? How does an unofficial 4.2 40-yard dash and a 10’3″ broad jump sound? I’m sorry, let me repeat that, THE GUY HAD A 10’3″ BROAD JUMP AND HE’S 5’8″. Once Pro Day started to wind down, multiple scouts stayed after to watch Mathis return punts and see his burst. Although it’s extremely doubtful Mathis will ever play at the next level as a cornerback, punt returner isn’t out of the question. 4. Ifo Ekpre-Olomu is frustrated. Ekpre-Olomu, a former first round prospect, is having to sit on the sidelines and watch his draft stock plummet after tearing his ACL. The cornerback said, “The hardest part is having to only tell people what you think you can do, and not being able to show them.” Clearly he still believes he can perform at a high level, and with his timetable set to return in September, he’ll have his chance soon enough. 5. Who will be the fifth Oregon Duck drafted? Will Malone be the fifth Duck drafted? At this point, there is a clear top four from Oregon. Mariota and Armstead lead the way, and not far behind them are Ekpre-Olomu and center Hroniss Grasu. All are believed to be third round picks or better, but after that nothing is certain. Tony Washington shows promise as a pass-rusher, but scouts appear to be wary of his coverage skills. Erick Dargan had a career year for Oregon at safety, but teams are concerned about the fact that he’s a little on the slow side and undersized. Finally, Derrick Malone showed moments of excellence for Oregon at the LB position but, like Washington, he had major lapses of judgment in coverage. Although all three players are expected to be taken, the order in which they will go is a complete mystery.